Sonoma State University is hosting several events throughout the month of April for Sexual Assault Awareness Month. "There have been more students involved this year including several Greek organizations wanting to sponsor or host events," says Deputy Title IX Coordinator Jesse Andrews. "It's been really wonderful to see an increased level of participation in sexual assault awareness." New events that are being added to Sexual Assault Awareness Month include multiple relationship violence escalation workshops sponsored by the One Love Foundation. Relationship violence is something that 1 in 3 women and 1 in 4 men in the United States will experience in his or her lifetime. These workshops cover what unhealthy and potential dangerous relationship behaviors look like and how to get help. Other events include a self-defense workshop, sexual assault awareness tabling and an event that teaches how to support victims of sexual violations and more. 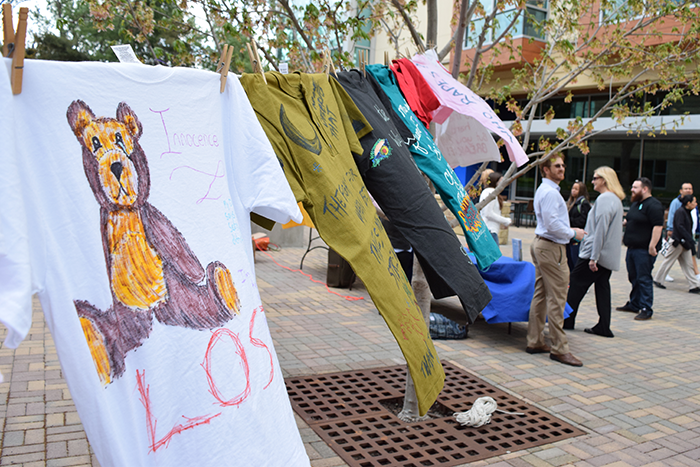 The Clothesline Project will be on display in Salazar Plaza April 4-6 to raise awareness and initiate conversation about the issue of violence against women. Those who have been affected by sexual assault are invited to express their emotions by decorating a T-shirt and hanging it on the clothesline display. The display honors survivors, aids the healing process and acts as a memorial for victims. Sexual Assault tabling takes place on April 26 in Seawolf Plaza in conjunction with Denim Day, where people are encouraged to wear jeans or denim to raise awareness of sexual assault. Sonoma State's Take Back the Night event will be held in the Student Center Ballroom on April 26. This event aims to empower survivors by publicly speaking up against violence through creative mediums such as open storytelling. The night aims to support, empower and inspire the campus community by uniting all voices and demanding the community to be free of all types of violence. The One Love Foundation was created in 2010 to honor the memory of Yeardley Love, a University of Virginia senior who was beaten to death by her ex-boyfriend just weeks short of graduation. Prior to that day, Yeardley's friends and family had no sense she was in danger. In the months that followed, they were stunned to learn that relationship violence is something that 1 in 3 women and 1 in 4 men in the United States will experience in his/her lifetime. Research also shows that young women ages 16-24 are at three times greater risk and have limited awareness of this fact. One Love's focus today is changing these statistics by sparking conversations in schools and communities around the country. One Love works to give others the information that Yeardley and her friends and family didn't have about what unhealthy and potentially dangerous relationship behaviors look like, empowering them to help themselves and their friends. To do this, One Love focuses on building emotionally engaging, powerful content and tools that meet people where they are, show them the relevance of this issue in their own lives, and inspire them to join a movement for change. Have you ever struggled to support victims of sexual violation? Sexual assault is a pervasive and serious social problem, made more insidious by a shadow of shame that isolates survivors and creates obstacles to justice. But there is a lit path out of the darkness -- a new paradigm, based on Joseph Campbell's "Hero's Journey" -- that provides tangible tools and techniques to guide survivors to healing, empowerment and justice. In this interactive, engaging workshop, Lisa Foster, founder of Parillume, shows you how to lead survivors through their "Hero's Journey" from survivor to thriver, and how to transform the conversation about sexual violation from shame and silence to heroism and fierce hope. Sexual assault -- on-campus and off -- is a pervasive and serious social problem. But the path to social justice begins with personal justice: The transformation from survivor to hero, and from shame and silence to empowerment and fierce hope. Join Lisa Foster, founder of Parillume, to explore the Hero's Journey for those who overcome sexual violation: A tangible, lit path to a personal justice that is the foundation and fuel for transforming the world. Interested in learning more about sexual assault awareness and how to support survivors? Come out to Seawolf Plaza to meet on-campus and local resources for education and support. Wearing jeans on Denim Day has become a symbol of protest against erroneous and destructive attitudes about sexual assault. Stop by Seawolf Plaza to receive your Denim Day sticker and to meet on-campus and local resources for education and support.